Buddhist semantic realists assert that reality is always non-linguistic, beyond the domain of conceptual thought. Anything that is conceptual and linguistic, they maintain, cannot be reality and therefore cannot function as reality. The Pra ̄san ̇gika however rejects the realist theory and argues that all realities are purely linguistic—just names and concepts—and that only linguistic reality can have any causal function. 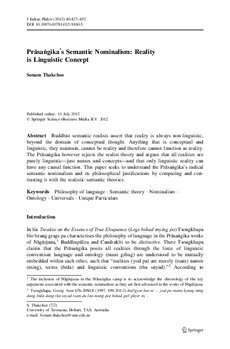 This paper seeks to understand the Pra ̄san ̇gika’s radical semantic nominalism and its philosophical justifications by comparing and contrasting it with the realistic semantic theories.